Trained volunteers are to undertake a new project to record some of the curious and fascinating historic graffiti in Canterbury Cathedral. The team of nine has started the pilot study after training earlier this month by the Cathedral’s Archaeologist, Nathalie Cohen and Matt Champion, who is the UK’s leading historic graffiti expert and author of Medieval Graffiti: The Lost Voices of England’s Churches. 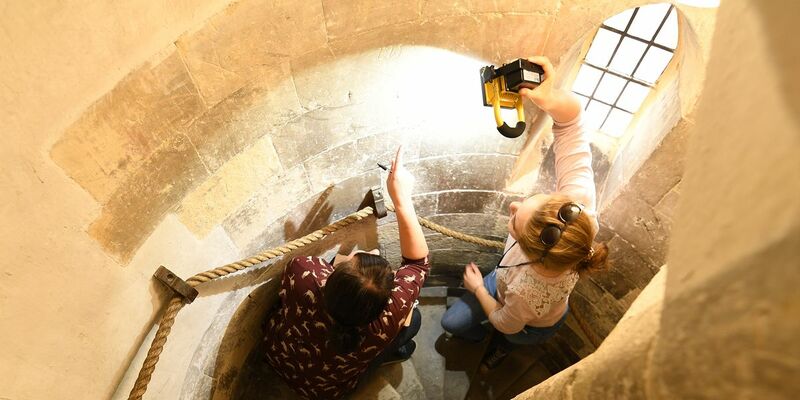 The project is part of the Learning and Participation work of The Canterbury Journey – the Cathedral’s £24.7 million programme to conserve and safeguard the building and improve access to its collections and heritage. The Cathedral’s vast amount of historic graffiti was identified, following public consultation carried out at the beginning of The Canterbury Journey, as being of particular interest with younger audiences, artists and historians. So as the volunteers gather data about the graffiti and images they will also be creating a resource of information to be shared with the public through a programme of talks, tours and online activity. The material will be more widely interpreted by the Cathedral’s Artist in Residence, Greg Stobbs, who will be working with the local community to develop an exhibition to coincide with a planned Art of the Lost conference in November 2019. See some of the volunteers’ favourite Cathedral graffiti here. The Cathedral's mission is 'To show people Jesus'.